First, the announcement! I’m doing some coloring templates for the Colorist App, and my first book of ten pages – called DoodleWorlds – is now available for it! Colorist is the only app that lets you color with exactly the same feel as coloring pencils! 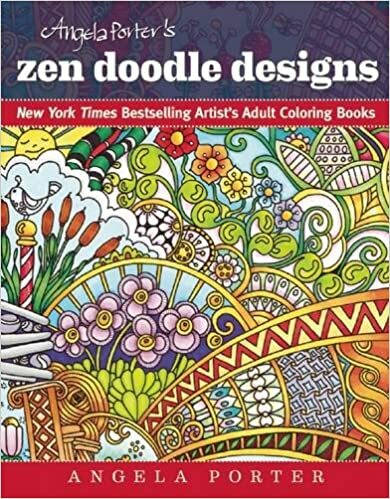 Relax on the couch and enjoy coloring a complex design, a vacation spot, or a crazy cartoon cat – tons of pages to choose from. Even color the same picture more than once, to see what else you can do with it. No need to worry about losing your coloring pencils in the couch anymore! I have tried the Colorist app out, and here’s an honest review of it. I had a quick look at the app before I agreed to do any design work for Faction Apps as I’d not want to have my artwork on any platform that I didn’t think was a good thing. I’ve given it a test run using my Surface book and the Surface pen. I haven’t tried it out in touch mode with my finger. You can see what I did in the image above, which is one of the free downloads as my own weren’t available at the time I did this test. Here’s a close up of the section I coloured in. There’s a large number of colours available in the palette, and the bar that appears beside the image retains the last eight colours you’ve used, which is really useful and makes colouring in areas you want in the same colours easy to do. It also means it’s easy to use many colours to get a smooth colour gradation, something that you can’t do with other colouring apps I’ve seen. There’s a slider bar with the tool so you can select the width of the pencil stroke, which is great. The finest settings allowed me to add patterns to the image. This is something that sets the app apart from others I’ve seen, which only allow a flood fill. The finer lines and the ability to zoom in to the area you’re colouring mean you can get into the tiniest areas to colour, which at the original image size may have been a challenge, especially when printed on paper and coloured using coloured pencils. The line isn’t a solid line, it has texture to it just as if you’re colouring on paper with a ‘tooth’ (texture). This means that optical mixing of colours is possible, as well as adding texture to that mixing. It also means that a smooth blend of colours is achievable. The colours lay nicely on top of each other, thanks to that bitty texture; one colour doesn’t obsure the other, unless you use a lot of pressure and it’s what you want. Oh, the colours don’t obscure the black outlines of the colouring page, no matter how hard you press. My surface pen is pressure sensitive, and that makes the colouring experience a lot more comparable to colouring on paper with pencils, but without the mess! I don’t know what it’s like on a screen that isn’t pressure sensitive, or how it works if I use my finger instead of the pen. I am really impressed with the results and how the pencil tool works. Also, I can get a bit irritated when I’m colouring with physical pencils; they often make my arthritic joints ache. No such problem here; indeed, I wanted to carry on colouring but had to put it aside so I could get on with other things. It works! However, I preferred to use the white from the palette to erase small areas to add highlights as I could control the thickness of the line being used to remove colour. The undo button would be really useful too. Together, they are things you can’t do when you’re colouring on paper, well not easily. You can save your work at any time by using the save button on the app. You can also colour each page in as many times as you like in as many different colour schemes as you like too. I like this app, very, very much. I found it easy to use, quick to master, and it gives really lovely results. It’s a well thought through app, it does what it says it does, and the experience and results are a lot like using coloured pencils on paper! I just want to repeat that although I have done some artwork for the app, these views are my own and not influenced by me working for them; if hadn’t htought the app was a good product I wouldn’t have agreed to do work for them! In June 2016 I have two more colouring books coming out from Skyhorse Publishing. Are there rules to colouring in? I have read many times on various facebook groups how people worry that they aren’t colouring in colouring sheets or books correctly, or they are worried that their work won’t be up to scratch compared to what they see as the amazing work done by others in the groups. 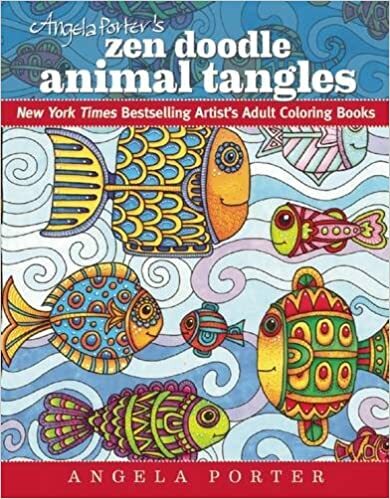 I think I may be qualified to comment on this and to offer some advice, especially as I have now created hundreds of colouring templates for Color Me Calm, Color Me Happy, Color Me Stress-free, Entangled, The Can’t Sleep Colouring Book, Japanese Patterns, Scandinavian Folk Patterns, and 60’s Patterns, with more to come! Firstly, I’d like to ask you why do you want to spend time colouring in? Is it for relaxation? Is it for fun? Is it to combat boredom? Is it to while away the time while you are poorly? Is it for some other reason? Is it for enjoyment? Is it to lift your mood? Is it because you love colour? Are there other reasons? Notice, I ask what your reasons are for colouring, not telling you what mine are. Your reasons can be as private or as public as you wish. The colouring templates I have created (and continue to create) have been done with relaxation, joy, enjoyment, lifting moods, taking a break from the crazy pace of modern, technology filled life. They offer an opportunity to take an almost meditative break from every day life, space for some ‘me time’, some self-caring time. That was, and is, the aim behind the Color Me books. In none of the books are there a list of explicit do’s and don’ts for the use of the book (apart from the copyright stuff). And why should there be? They are there for you to make your own, for you to have pleasure with, for you to find ways of expressing yourself, to go back to a time of childhood innocence where there were few rules and responsibilities. They are there for an opportunity for you to become as carefree as you wish. Rules, do’s and don’ts, am I doing it right?, and all these other judgmental thoughts or questions have no place in these books, or similar books. You can do no wrong! Trust me. You really can do no wrong! Really, you are invited to do as you wish to with the colouring templates. Want to use coloured pencils, wax crayons, chalk pastels, oil pastels, acrylic paints, marker pens, watercolours, collage, glitter, sparkly gel pens, scented pens, stickers? Want to use many different mediums? Go for it! Enjoy it! Do whatever you feel inspired to do, whatever you’d like to try out. Want to split larger sections into smaller ones? Want to join small sections into big ones? Great! Do what you feel you’d like to do! Trust your instincts, trust how the image is speaking to you. Want to fill sections in with patterns? Want to add words or phrases? Want to add little drawings of your own? By all means do so! Worried you’re breaking some rules of art, or colour theory? Don’t worry! There are no rules here – if it pleases you that is all that matters! If you’re using the colouring to get some insight into your emotions or inner thoughts, then don’t worry about all that colour theory stuff, express yourself! Worried that you’re using the media wrongly? Don’t worry! If it works for you, it works for you! If you’re happy with the result and enjoyed the process, does it really matter what one person or another says? No, it doesn’t! If it’s not quite working for you, don’t give up, experiment, and enjoy the process of exploration, of discovery. You do not have to be an instant expert! It’s ok to be a learner; in fact we all learn for the whole of our lives and what is so bad about that? Nothing! Do you think Leonardo da Vinci just painted the Mona Lisa one day, without years of practice and experimentation, of finding out how to express himself artistically? Of course he didn’t! I give you permission to play, to use different media, to shade or not shade, to blend or not blend, to simplify, to make more intricate, to break the rules. Talking of rules, where did you learn all these shoulds/should nots of colouring? Why do you still think they are so important? Why do you think that plants can only be green, the sky blue, rocks grey, the Sun yellow, the Moon white. Let me give you permission to make all these things, and more, any colour you want! I give you permission to break the rules! You want pink trees with bright purple trunks – absolutely! You want a lilac Moon – not a problem! You want to put fuchsia pink and lime green next to each other – what a wonderful idea! I give you permission to express yourself with colours as a child would, with no rules, but with sheer pleasure and enjoyment! I believe that inside each and every person there is a creative soul seeking an outlet, and colouring is one way of access things, and who knows where it will lead, what new talents you will discover hiding inside yourself, who knows how it will help you heal, to find new solutions to old problems, new insights to what is going on, as you take a break from worrying and all kinds of thoughts whirling around your head. Now, what’s the worst that can happen? You end up disliking something, wasting a little bit of felt tip pen, using up one piece of paper with a printed image on it. Is that a bad thing? Ask yourself why you dislike it, what is it trying to tell you, what lessons you can learn from it. Write notes on the image or the reverse of it, use it to explore yourself, use it in a positive way. Remember, no one ever has to see what you have done, not unless you wish to show them. Worried that people will be critical of what you have done? Don’t show them! This isn’t for other people. It’s not a competition. It’s not to see who can colour the smoothest or stay inside the lines (it’s quite all right to go outside the lines or not go right up to the lines too, you do what you think is right). It’s something that is entirely for you. If you’re pleased and proud of what you’ve done and want to share it, then please do, but don’t feel you have to. Remember, the whole point of this is for you to enjoy yourself, to get messy, to play with different media and images and colours the way you feel you want to at any particular time. Remember, in art there are no mistakes, only happy accidents! Sometimes the things we think are mistakes are actually something beautiful and wondrous in their own right, something we learn from and incorporate into our future creativity. The only ‘rules’ there are in this are the ones you impose upon yourself. There are no colouring-in police. There are no international laws about how to colour in. A last note, I would love to see what you do create and the story behind it and yourself, especially if the process is helping you heal or overcome various difficulties in your life. That is one of the dreams I have for how my art can be used.